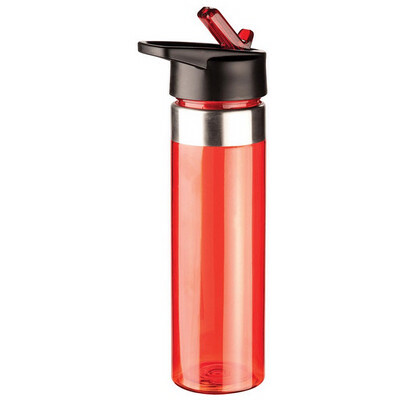 Description: Modern design 600ml red drink bottle with unique sipper screw top and internal straw for easy use. Available in 3 colours. Features: Made from BPA free Tritan material. Packaging: Polybag. Colour: Red body with black lid and silver trim. Material: Stainless Steel and Plastic Product Size: 240mm(h) x 66mm Ø. Other Methods: Contact your decorator for applicability and size. Freight details: 48 per carton, 9kgs, 43.5 x 37.5 x 51.5cms; Decoration Type(s): Colour Print / Laser Engrave . Decoration Area: Pad: 45mm(h) x 45mm(w). See drop down menu for decoration options.